Home / Health / Does alcohol help you sleep better? If you are someone who likes a nightcap, but worry that it will affect your sleeping patterns, or someone who hopes that a drink before bed will help them sleep, there is good news and bad news: In fact, the answer is both yes and no. Read on to see why, and to see what might work better than alcohol to put you to sleep, and allow you to sleep through the night. Usually, in television, movies and even books we see and hear anecdotes about people having a nightcap and falling asleep, right away. While there is some research that does confirm this fact, that same research shows that drinking alcohol right before bed, no matter what kind, be it hard liquor, wine or even beer, actually disrupts your sleep during the night, providing you with a poor night’s rest. Recently a piece in the respected journal Alcohol: Clinical & Experimental Research1 consolidated all prior of the research on the effects of alcohol as it pertained to sleep. Again, there was good news and bad news. Keep in mind these studies used healthy individuals. The research showed that a drink before bed did actually help users fall asleep faster. So, if you are looking to go to sleep right away, a drink can help. 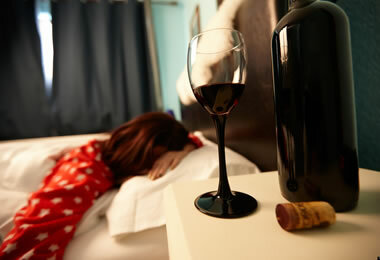 And, the studies showed that those who did have alcohol right before bed actually had more of the ‘deep sleep’ period. The ‘deep sleep’ is the part of our sleep when the body actually repairs and regenerates. So this is good news! However, in a typical night’s rest, your body will alternate between REM sleep (this the rapid eye movement portion of our slumber) and non-REM sleep. These typically occur in 90-minute cycles. “Deep sleep” is one of the forms of non-REM sleep. This is when your body is regenerating and rebuilding the body’s tissues, muscles and bones. This is the period of sleep when the immune system is strengthened. But REM sleep is just as important, even more important, really, for the brain. This is when we dream. The researchers in this story called REM sleep the portion where the body “defragments the drive” and they lament that getting too little REM sleep will actually have negative effects on your body’s memory and concentration. So, the good and the bad: Alcohol puts you to sleep, and boosts your deep sleep, which is great, but it reduces REM, so your memory and concentration are shot. If you have ever had a baby, or a puppy for that matter, you know a lot about not getting a full night’s sleep. You wake up a million times in the night, because your baby (or puppy) does. You get up, you go back to bed, and you fight for sleep. This is exactly what happens when your body is under the influence of alcohol before bed, too. The ‘good’ parts of that nightcap come only during the first part of the night. After that, you will begin to wake at intervals, tossing and turning. You will not sleep deeply during this second half of the night, and you will wake up a lot more than someone who does not drink before bed. Lavender: Sprinkle pure lavender oil on your pillow before you go to bed. The calming scent is said to relieve stress and lull us to sleep. There are also lavender scented pillows on the market that you can buy to sleep on. Bath: A nice bath before bed (and one that perhaps uses lavender scented bubble bath or oils) is a great way to de-stress, reset your mind and fall asleep faster (and stay there). Unplug: The blues of your computer screen, iPhone, and even the television can keep you up at night. Even unplugging thirty minutes prior to bedtime (maybe for that bath, or pick up a book) can allow you to fall asleep when your head hits the pillow. Also, do not exercise before bed. Stop your workout at least two hours prior to your bedtime, so that your body has time to really cool down and the heart rate can completely lower before bed. Warm milk: Yes, it seems like an old wives’ tale, but the truth is, sipping warm milk or even a nighttime tea, designed to promote sleep, can have a positive effect on our sleeping habits. Why? Studies show that the warm milk (and it can be any type of milk, not just cows’ milk) each night lulls you, it is habit forming. It is actually soothing, and calming, and preparing you for rest. The bottom line is that once in a while, especially if you need to fall asleep right away, a nightcap can come in handy. But overall, if you want a nice restorative sleep that gets you from bedtime to wake up, you will want to skip the alcohol and opt for another solution. All the points in this article are very accurate and legitimate, but I’ve found that a little bit of alcohol before bedtime can do wonders for me. I’ve been having trouble falling asleep for my entire life, and I discovered that a glass of wine or beer before I go to bed really help. For me, the trick is to not go overboard, otherwise I dehydrate easily, wake up throughout the night and can’t perform well at work.